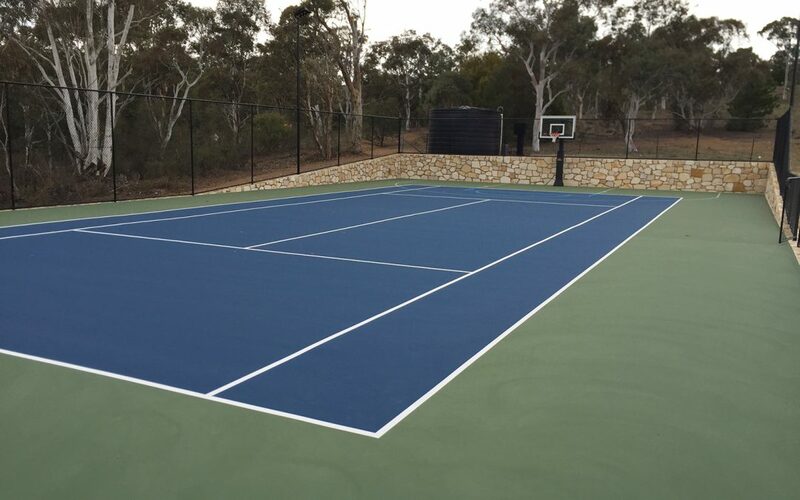 This premium tennis court is a stunning addition to our client’s recently purchased property with blended line marking for tennis and basketball. Framed around the perimeter by a spectacular sandstone retaining wall this court really is a ‘grand design’ and will give its owners many years of healthy entertainment with its flexible cushioned surface. Major earthworks began this project, allowing the construction of a concrete slab. The client opted for the superbly cushioned surface of the Rebound Ace HSA Club acrylic product that provides the perfect combination of performance and player comfort. Utilising a 4 mm rubber mat, HSA is the ideal surface solution for competitive play and physical wellness, with less shock on your joints you can play for longer. The HSA Club surface is topped with Rebound Ace Ultra Top Coat that also offers 12 of the most vibrantly pigmented colours in the industry. Our client went with a striking combination of royal blue on the play area with a moss green surround. 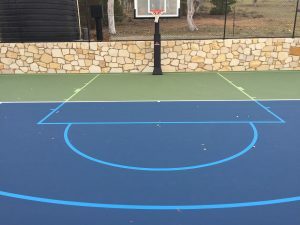 The Dynamic Sports Facilities team also installed 3 metre high black fencing around the court complete with top and bottom rail, complimented by the stone retaining wall which gently slopes back towards the court. Our team also installed tennis posts and a net as well as a Goalrilla adjustable basketball tower. The supply and installation of four very power efficient premium LED lights, which are incorporated into the fence, completed the job. This family can now GET ACTIVE on their own backyard multisport court! Adjustable basketball tower with the sand stone retaining wall in the background. Plus there are so many sport combinations we are sure to have one that your family will love. Take a look at our court planner for some inspiration. Perhaps your kids are into cricket? We can build practice nets and a wicket. Or perhaps your child is the next Greg Norman? Why not build your own golfing green at home? Contact our team for an obligation free quote. We can do a site inspection and assess your requirements and provide recommendations.